If you rely entirely on timber for your turnings, then you need do so no longer, as I hope to show you in this article. Timber is not necessary for turning, or maybe only somewhat. For the last few years, I have created my own 'timber' using natural materials, such as corn meal, rice, paprika, lentils, etc. or unnatural materials, such as printer toner and rust, and mixing them into epoxy resin. Sometimes I slip in small turning block cutoffs, little branches or seedpods just to stay connected with wood. 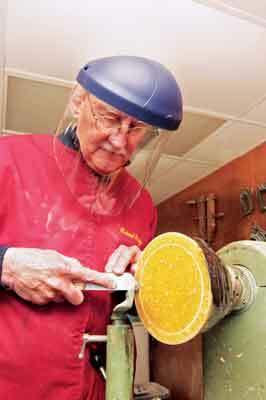 Once the resin mixture sets up into a block or a log, it can be used just like a woodturning block or a wooden log. Strange, you might feel, even much too odd, but reading on I hope you will see that this is just a new way to grasp control over a finicky material. You are still a turner, but now you can define the colour, texture, pattern and form. You'll like that. I do. 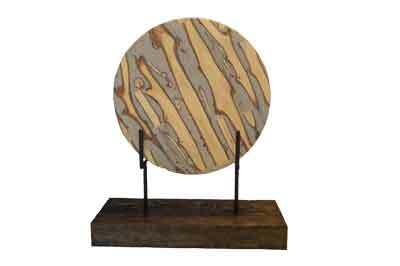 I think I first got an idea for this new 'timber' through Michael Hosaluk's rice-embellished bowl, which I saw in the AAW's 'Japanese Bowls' exhibit a few years ago. To initiate that exhibit an assortment of turners were given rough wooden bowls and instructed to carry them on to an artistic finality. 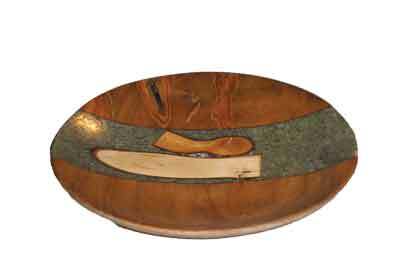 Hosaluk coated his wood bowl with rice, hence it was called a 'rice bowl'. Later, I was part of an art group that initiated an exhibit called 'Black and White'. I was initially quite perplexed. This assignment might be easy for a photographer or a pen-and-ink artist but what should a turner do? Use holly (Ilex spp.) wood? Burn my wood? What? Serendipitously an idea came to me to mix black and white rice with resin in a yogurt container. 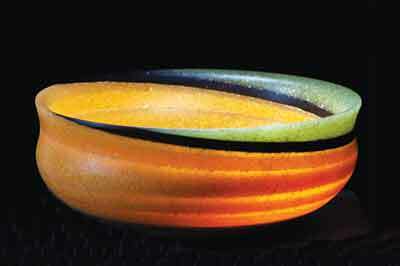 The result was a cylinder that echoed the colours and texture of Hosaluk's rice bowl. 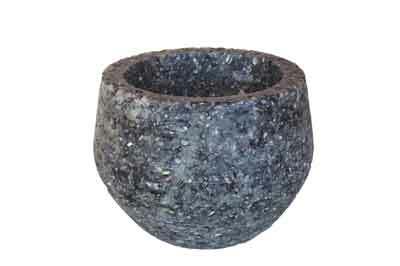 I turned my cylinder thick and rough, making it look much like an ancient stone bowl or, my Mexican friend said, a molcajete, which is a bowl that is used to grind hot peppers. Pleased with this happening, I began considering trying other materials. My neighbour had just opened a bulk food store full of bins of grains, rices and spices that had wonderful colours and textures. I also drove into nearby Chicago, to the Asian market section, where an immense number of spices in large containers are sold at very reasonable prices. Also, a local art supply store sold sticks of pastels that artists use to draw. Wood came from little branches I had snipped from trees and dried quickly with a light bulb in a small plywood box. These little branches were fine because they could be gleaned from a tree that could stay alive, they had an abundance of crotches and they dried in less time than a log or a plank. In addition, I scavenged cutoffs from past projects where I couldn't toss odd chunks of beautifully coloured or patterned real wood. First, select a basic form. 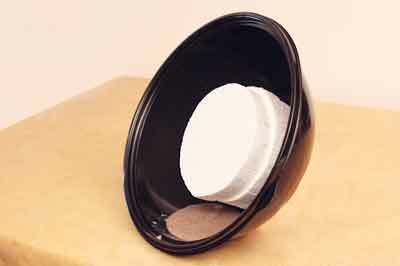 Bowl and vase forms can come from empty containers. My favourite is a plastic yogurt container, which measures about 120mm in diameter and 305mm tall. 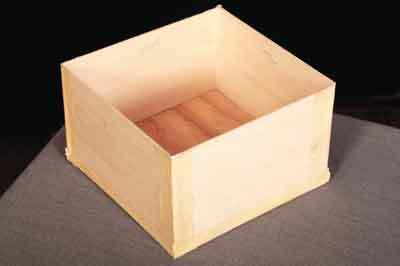 Turning blocks can be created by building a square form with thin wood from a craft store. I like a block about 150mm square and 75mm high. I made a couple of large bowl forms from a plastic globe that had cracked in half at the equator. 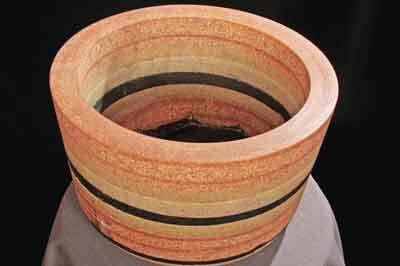 In the second article in this series, I will describe how I used a plastic container to create a resin cylinder with concentric rings, much like tree rings. Now mix the resin. I use West Marine brand, which comes in a 3.7l can of resin and an 814ml can of slow hardener. Be aware that it's pricey. I like this brand best because they sell mini pumps that dispense equal volumes of liquid, their prescribed resin to hardener mixing ratio. This makes life easy. 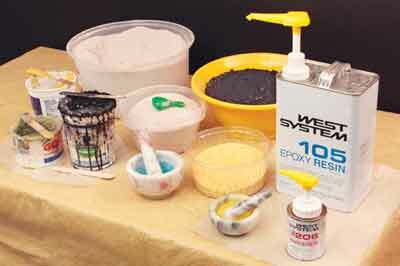 In your region, try a local shop that sells epoxy resin. 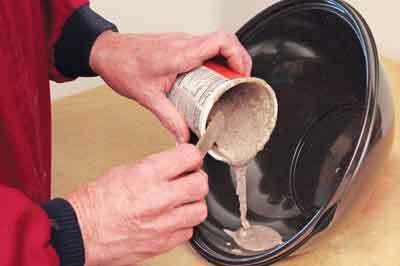 I mix the resin and hardener in the yogurt container, then mix in other enhancements and pour all into the form. When the mould is large, I use Styrofoam inserts to reduce the resin volume. 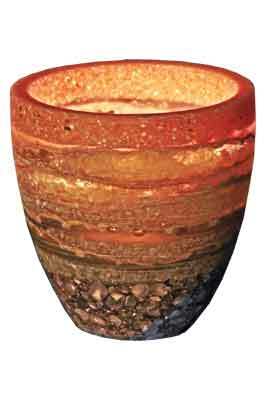 You should never pour to a depth of more than about 25mm in the form as thick layers can get quite hot. Note: when the layers get thick there can be bubbling. Personally, I like the bubbles as they make the final form look more ceramic and create interesting effects. Some people use a vacuum system to remove the bubbles but I have never tried this. As the layers are poured, a line separates each. This is useful as an artistic feature but it also lets one track how many days it took to make the final form, so you can impress a potential buyer by saying that it took 'X' days to make the basic form, even before you began to turn it on the lathe. You can then select the enhancements. Blue and yellow corn meal are my staples for adding colour. I also use green and red lentils, green bamboo rice, red Himalayan rice, Chinese black rice, coffee grounds, printer toner, diatomaceous earth - white - etc. I tried turmeric for its gold colour but, when mixed with epoxy, it turned russet, the same colour as paprika. I made some homemade paper and that worked too. Coloured pencil pieces can be distributed for colour and pattern. Toner is especially black. Powder aniline dyes work as well. Buckwheat, lentils and rices are good for texture. Anise flowers also work well. For some materials, I reduce the texture to a powder with a coffee grinder. This also works for the pastel sticks. 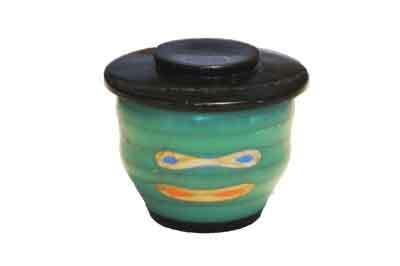 I once ground malachite stone to dust with a mortar and pestle. Used coffee grounds don't need any treatment, nor does used printer toner. Some materials will pass light. Yellow corn meal, green bamboo rice and some pastel sticks are good materials to use. Most of what I use is dry; however, there are some liquid dyes, specifically methyl ethyl ketone dyes, that give pastel shades. I believe anything water-based or oil-based won't work. With dry materials, experiment to get a functional consistency. Too much additive will make the mixture sluggish; too little will allow the material to sink and leave an empty band at the top, which may not look good... or it might. Finished pieces do take acrylic paint. I have a difficult time throwing away colourful and highly patterned cutoffs, even if they are small or oddly shaped. However, they are perfect in this case as they can add interesting colours and shapes. Little branches work well too since they can be snipped without hurting a live tree. It is easy to find many crotches in a couple of handfuls of these small branches. The only drawback is they mostly lack showy heartwood. Unlike logs or planks that take months to dry, little branches and small branches can be rapidly dried in a microwave oven or even, in a matter of a few weeks, with a light bulb in a small plywood box. Next, select your tools. All the standard turning tools work on resin materials. Resins are not particularly hard and cut easily. I especially like narrow parting tools - such as those by Henry Taylor, Ashley Iles, Robert Sorby, Crown Hand Tools, etc. 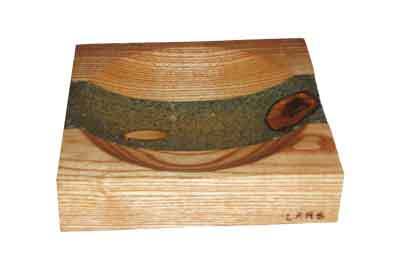 - used edge-on or reshaped to curves to scrape off the resin. Now to turn your form. There is really no need at this point to belabour methods. Any method you used on real wood works on resin blocks. This includes sandpaper and steel wool. Polyurethane finish works, too. There are issues in using epoxy to make and use these out-of-the-ordinary objects, but not all issues have a clear answer. Most of the cautions you use with volatiles, dusts and caustics apply to resins. See the health and safety information below. For the West Marine epoxy resin and hardener you can read the MSDS in full online. Start by clicking here. The full MSDS will appear. With the resin, skin contact is the dominant health issue. Carcinogenicity is not an issue. For short exposures, there may be allergic reactions and some irritations like redness and itching. For prolonged exposure, there may be sensitisation or moderate irritation. Short-term and prolonged inhalation are not considered likely to cause major effects. Overexposure could lead to sensitisation and allergic reactions such as redness and rashes, but repeated exposure is not likely to cause other adverse health effects. For hardeners, you will need to be more conscientious on health issues. Contact with the skin and eyes and inhalation are the dominant health issues. Carcinogenicity is not an issue. The liquid is corrosive and can cause burning and blistering while the corneas could be injured from a splash, with blindness the extreme result. Skin and lung absorption is possible with a risk of internal organ damage. "Do not breathe vapours or mists from heated material" (MSDS). Chemical resistant gloves are recommended. The eyes should be protected with goggles or a full-face shield. The lungs should be protected, including the use of a full-face respirator. Ventilation is prudent. My own experience with West Marine materials is that I have never noticed an odour nor have I ever experienced itching, rashes, headaches or other exposure symptoms. By far a major issue when mixing is heat. When I bought my first resin, a store employee told me he mixed a soda can full of epoxy and it melted the can. 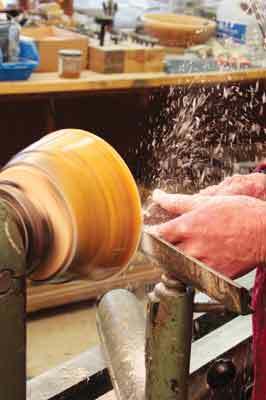 The MSDS warns that hot epoxy can ignite surrounding wood chips and sawdust. As a result, I never pour more than 25mm of mixed resin into a mould - chosen by experience. Even with this thickness, bubbles can form on the top of the layer. Since many of the items I make could be used for food, I have spent quite a bit of time trying to find out if the cured resin is food-safe. The answer is that nobody seems to know. The resin manufacturer wrote to me and said: 'West Marine has limited to no exposure to food safety issues and epoxy'. The US Consumer Product Safety Commission wrote: 'We cannot answer your question'. It seems this has not been an investigated issue. As a consequence, I go with the Precautionary Principle: 'When an activity raises threats of harm to human health, precautionary measures should be taken even if some cause and effect relationships are not fully established scientifically'. The Precautionary Principle is even part of the European Union regulations. My statement to my customers is that dry foods - nuts, sweets, crisps, etc. - 'probably' are usable in epoxy bowls but wet foods - soup, salsa, guacamole, etc. - are an unknown and I don't recommend that. Fundamentally, 'working cleanly and following basic precautionary measures will greatly minimise the potential for harmful exposure' (MSDS). Neither the resin nor the hardener are considered hazardous wastes under US environmental laws. Thus, there are no restrictions on disposal. However, the MSDS cautions to avoid inhaling vapours from heated resin and burning the hardener, '... can generate toxic fumes'. Thus, burning wastes is imprudent.